Eggplant and Basil grown in the Library Grow Box with seeds from the Seed Library! Seeds can be checked-out with your PPLC Library card just as you would any other library material. They do not count against total items checked out on your account. We just do this for usage tracking purposes. The seeds are available are through community donations and because of this, supplies are limited. We asking that you limit your check-out of seeds to 7 seed packets at a time. There are no due-dates or overdue fines with your seeds. They are yours to keep. Seeds are arranged alphabetically in the Seed Card catalog with the following categories: Vegetables, Herbs, and Flowers. We hope that you will be successful in your growing and and will return a portion of the seeds harvested back to the Seed Library, keeping a portion for yourself. Happy Growing! 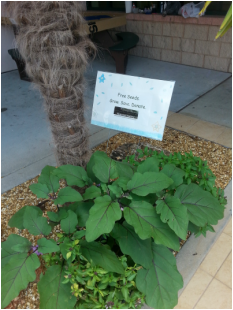 We hope you share pictures of your seedlings and mature plants via email to shplref@cityofsafetyharbor.com. If needed, use the scrap paper to record notes about your seeds. PLEASE DO NOT REMOVE INFORMATION SHEETS IN THE ENVELOPES. PLEASE DO NOT TAKE THE ENVELOPE, ONLY THE SEED PACKETS INSIDE. Limit of seven small seed packets per day, please.